It was a warm Tuesday night a week ago when a trio of Crook County High School athletes took the field for the Bend Bucks in a wood bat summer league game. The trio of players included catcher Heath Pickhardt, who has signed a letter of intent to play baseball at the University of Oregon, as well as sophomores Brody Connell and Kyle Knudtson. 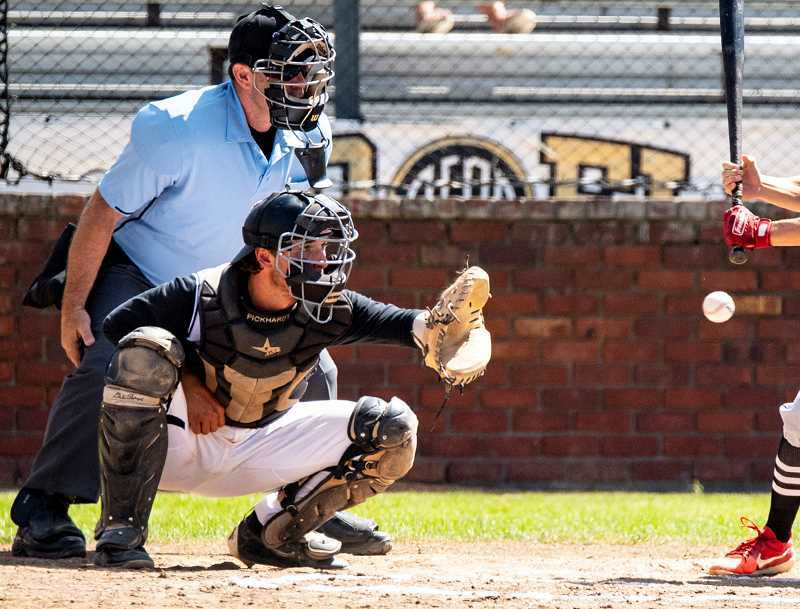 Pickhardt, who swings between the Bend Bucks and the Bend Elks, is one of the older players on the Bend Bucks' roster after recently graduating from CCHS. Now in his third year playing for the Bucks and his first year playing for the Elks, Pickhardt lives for the opportunity to play baseball. "It's been a good summer," he said. "The team is great. We have a good time. Summer ball is always fun." Pickhardt, who caught both games of a doubleheader on Tuesday, is on something of a tear at the plate. In the opener on Tuesday, he was two for three with a walk. Then in the nightcap, he went one for four, although two of the outs were hard hit line drives that just happened to go straight at defenders. "I've been seeing the ball pretty well," he said. "I got a couple of hits with the Elks the last series. It's just about getting at-bats, seeing pitches, and obviously catching." Knutson, the youngest player on the Bend Bucks roster at 16 years old, has only been pitching for the Bucks, seldom seeing plate appearances. As of Tuesday night, he had started three games as well as throwing a few innings in relief. "It was a struggle at first," Knudtson said of the step up to throwing against some collegiate hitters. "I came off of a really good high school season, so struggling after having success was kind of hard to handle, but after a couple of games, I think I'm starting to settle in." Knudtson noted that the difference between pitching in high school and pitching for the Bucks is huge. However, although batters are better, Knudtson added so is the team's defense. "It's crazy the difference when you have a defense behind you that you know that you can trust," he said. "You know that if you put the ball down and they hit grounders, they will field it for you. It's definitely a good experience. It's huge." Tuesday night, Knudtson started the second game of the double header. Although the opponents — the AIM, Athletes in Motion, from Hillsboro — hit the ball hard, Knudtson didn't give up an earned run in four innings. In his four innings of work, Knudtson gave up three hits, hit one batter with a pitch and walked one. AIM scored two runs in the top of the third after the Bend Bucks made their lone error of the evening. When Knudtson left the game, it was tied 2-2. However, the Bucks went on to take a 9-2 victory as Knudtson failed to get a decision. The Bucks had earlier won game one 10-0. Connell, the third CCHS player, didn't play in the first game of the double header as he was participating in a football clinic at Lewis and Clark University. 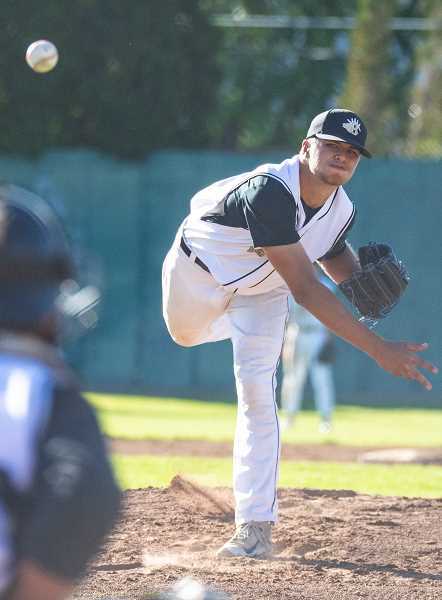 He arrived at Vince Genna Stadium in Bend just before the second game of the doubleheader started, entering the game in left field beginning in the sixth inning. Like Knudtson, Connell didn't have an at-bat on the night, and he played just one ball on defense. "It's pretty tough going straight from football to baseball," Connell said. "There's a lot of driving, but it's something that I think I need to do, and that's what I'm going to do for a while." All three Crook County players said that the game is much faster at the summer league level than in high school. "It's a pretty big adjustment," Connell said. "It's a lot more advanced and faster than high school baseball is. I think going back to high school it will really slow the game down for me." Connell, who catches in addition to playing outfield, added that catching against the next level of pitching is making him a better defensive catcher as well. Connell noted that both practice and games are helping to make him a better player. "The practice stuff definitely helps with a lot of learning, but game time also shows you how fast you need to be playing," he said. "It's a big change. It's a lot more serious here, and I think that everyone is here for a reason. It's been a great experience. I've learned a lot." Knudtson also said that he has learned a lot and the experience will make him a better high school player. However, he said that in addition to making him a better player, the experience is also creating lasting friendships. "It's a huge deal because now, not only am I treating the kids from Crook County as my brothers, I'm treating kids from other schools like Bend and Summit as my brothers. A lot of these kids are older than me, and they have really taken me in." In point of fact, they are all older than Knudtson, who is the youngest player on the roster. Pickhardt said that he understands exactly what Knudtson and Connell are going through. "Two years ago was my first year with the Bucks," he said. "I came in and it was just an eye-opener. I was caught off guard and I struggled bad the first couple of weeks and then, once I figured it out, it started to get better. It will be the same for Kyle and Brody." Pickhardt added that since his first year with the Bucks he has advanced as a player. Now, when he gets a chance to play with the Elks, he views it as an opportunity to prepare for the Pac-12, which has a number of players in the league that the Elks play in, while games with the Bucks are an opportunity to see more pitches and improve himself as a catcher. "The Elks are a lot faster," he said. "Everyone is older. Everyone is better, but at the same time, if you get that mental idea in your head that these guys are better, it's just going to catch up to you. So you have got to stay with the same mind set." Still, he noted that even the Bucks are a big adjustment from high school baseball. "Going from 4A high school baseball to players that play at the Pac-12 level is going to be a big adjustment, but it's a big adjustment for a lot of guys," he said. "I think that the biggest thing for me with the Elks is just getting comfortable catching Pac-12-type of guys. Catching the guys at the Elks, you know it's harder throwers, more movement, but for me, it's mostly just getting at bats." Whether playing for the Elks or the Bucks, Pickhardt is happy either way. 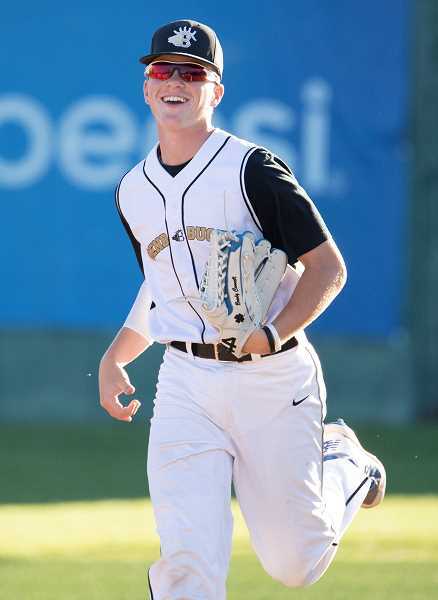 He said that playing for the Bucks enables him to see more pitches, get more playing time, and more at bats, all things that he expects to help him once he gets to the University of Oregon this fall. In addition, like Knudtson, he sees the opportunity as a chance to make lifelong friends. "Team chemistry is good," he said. "We spend a lot of time together, and it's a lot of fun." Bend Bucks manager James Cordes said that the Bucks have some disadvantages against some of the teams that they play. "Because Central Oregon is pretty isolated, you are limited basically to whoever is here," he said. "So we have more of an array of ages that are on the team, rather than teams that have a huge population of kids that they are pulling from." Cordes added that they had approximately 45 kids try out for the Bucks, including several players who had played for the team last year. Mixing new payers with experienced players can be a challenge, but Cordes said that the team is already beginning to gel. "We are developing," he said. "We are learning. We've taken our lumps, and we've had some successful games. It's a good roster." Cordes added that the returning players do a good job of showing newcomers the ropes and that the team has good chemistry. "We don't have any prima donnas," he said. "We don't have anybody out here thinking that they are too good for this team or anything like that, so in terms of the type of kids that we have, it's a great roster in that respect." He added that the Bucks are pleased to have all three Crook County players. "I tell you what," he said. "You can't ask for better makeup from kids than you have with those guys. What I mean by that is work ethic, accountability, I mean they are just great kids to be around. They are kids that you want on your roster, so we are happy to have them." The Bend Elks season ends on Aug. 7 with the final home game of the year. The league playoffs start on Aug. 9, assuming the team qualifies, while the Bend Bucks season wraps up with a home game on Thursday, Aug. 2. All home games for both teams are played at Vince Genna Stadium in Bend. "It's a little nerve racking, stepping up to this level," Knudtson said. "But it's a great experience and I'm learning a lot." Exactly what Cordes and the Bucks expect from their players.